A small party of Wingbeat club newbies comprising Ruth, Angus and Graham arrived at Sundhope just after 12:00 on a clear, bright and warm day. Sky looked great with quite a few Cumulus clouds arranged in neat lines running approximately North South. Gentle wind in the range between 8 and 12 mph aligned between North and North West. Angus popped in to the Farmhouse for a quick chat and we then parked near to the new barn. Just as we arrived we met Alex (plus Girlfriend and Farmer) who had just had a few runs along the ridge and was taking a break for lunch. Alex was very helpful in passing on a few tips about the site. We newbies then took the hike up to the top near the trig point. 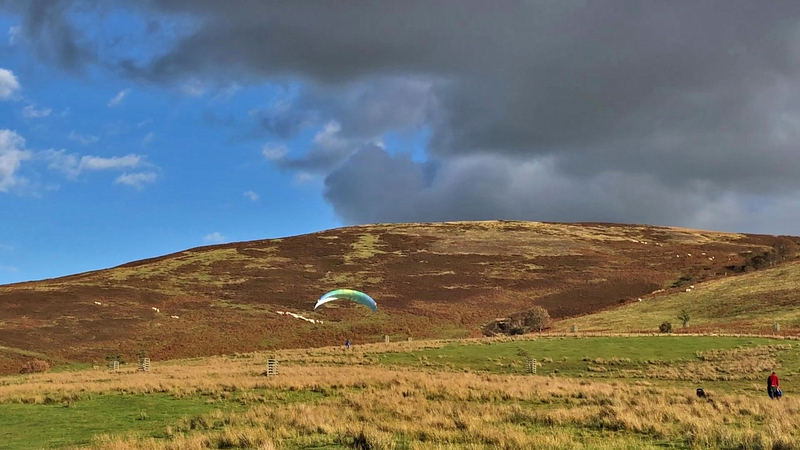 Conditions were perfect for each of the Earlston 3 to make fuss free launches followed by some friendly ridge soaring and subsequently some inexperienced and largely unsuccessful groping for thermals. I am sure those with more experience would have made much more of the conditions but we all had a great time and left around two and a bit hours after arrival jam packed with adrenaline and feeling pleased with what we had achieved. Our departure was accompanied by the sound of an off road vehicle running Alex's group up to the ridge and the sight of him taking off to skilfully exploiting the conditions. It's a great site and no doubt with a wee bit more heat or skill there are many that could have made it to cloudbase that day ! !